I have posted here but recently discovered a photo. 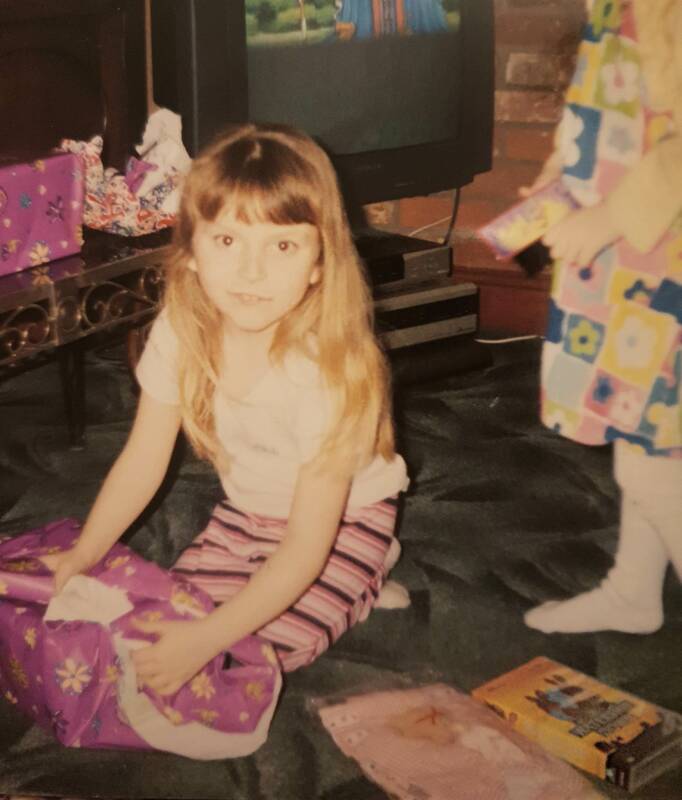 This is from a birthday, when I was about 5 or 6. I had unwrapped Watership Down on video. This, I think, is when I first watched it! Aww! It's so interesting to see old photos like that where you really get a sense of the times it was taken in (e.g. videos were still the thing!). My first contact was when I was about 10 years old when I saw something mentioned about the movie somewhere on some website. Didn't think too much of it at the time, then came across it shortly after in my school library, but didn't check it out due to the issue that my immediate thought was "oh, its about bunnies," which at the time didn't draw my interest. I also didn't understand the title. Fast forward to Freshmen year of high school (2010-2011) and I met a friend of mine who was and still is a big fan of Watership Down, and around two weeks before Easter I decided to watch the movie on Youtube and was hooked almost immediately. I Got the book as an Easter gift along with the movie. Found this forum a few months later during one of numerous google searches that I did for any fansites, fanart, fanfiction, etc. I only recently got in to WSD due to the miniseries that came on TV last year of which after watching that gave me a sudden interest and inspiration to read and watch other things related to WSD. Currently i have watched the 1972 original film and the 2018 remake and just finished watching the 1999 TV series which id say is my favourite of them all. I recently finished listening to Tales Of Watership Down book on Audible and now reading the Original book of which i am very much enjoying it. Also @SlyMeerkat since you're reading the novel, feel free to join in on our reading. Don't mind the dates, anyone can jump in at any time, and we're still ongoing. bbc netflix adaptation during the winter holidays. I immediately fell in love with the story and its characters how each is unique and the connections i could make with them. but it was really hard for me to see hazel die as he was my fav character. I remember it like it was yesterday (kind of cliche, huh?). We were in 7th grade, I think...and we had this thing called "Reading Rampage". It was basically used to encourage kids/class to read. So for 30 minutes, you'd pick a book and read it. Usually kids would bring their own book, but that day I did not have a book so my teacher told me to go fetch one from the shelf. I saw this old paperback with a rabbit on it, titled Watership Down. I remember opening it up, and sitting in the corner of the class near my friend Barbara reading, and the novel really had my full attention. I loved it, but I didn't get too far, maybe 2-3 Chapters. I wasn't much of a reader at the time, but I knew there was something special about WD. One funny part of the story is that I recall my friend Barbara asking me, "What are you reading?" and I responded with the typical 7th grade kid remark, "I dunno, it's about rabbits and sh#t," haha, good times. So I read it a few times for school, but the next time we had RR it was not on the shelf, it was gone. Needless to say I was pretty bummed out. After that I just kind of gave up on it, I didn't look for it at the library or ask my parents to get it for me or anything. Flash forward years later...I am 25 years old or so, I saw the book at books a million and it sparked my desire to read it, and finish it, so I bought it, read it, loved it. I am now 30 years old, so it took me a long time to actually get the book and read it, but I finally did it. I am not ashamed . I also bought the movie alittle before that, but never watched it (I didn't want to ruin the book, cause I knew I was going to read it at some point) so I left it on my shelf till I finished the book. I then watched the movie, and then found out about the new miniseries on Netflix/BBC and we just got done watching that yesterday. It's all wonderful. I love it, My wife loves it, my daughter loves it. I think as a kid it stuck with me, even those few chapters because it was something different from the usual books you might read as a class. I am also a big animal lover, so that really hit home with me (as a kid and now). I did read a bit of redwall in 5th grade too, so anything with animals is just awesome. Oh, by the way, when I first saw/read about the character Bigwig...I was really excited because one of my favorite bands growing up was Bigwig (punk band from NJ),and that's where they got their name, so I thought that was awesome when I was younger. As I said, now I am 30, I read all the time, and I am re-reading WD for the second time. I was 6 at the time, at a Hollywood Video with my mom and sister. She picked it up because she saw the rabbits, and we were both animal lovers (still are). Needless to say, we were pretty freaked out after watching it. So, of course, we watched it over and over and became obsessed. Only later did I find out it was based on a book, and it's still one of my favorite books today. We also watched the old TV series, and converted all our friends as well. We'd play it on the trampoline, and me and my little sister were always Hazel and Fiver. We even had a patch of woods in our backyard that we called Watership Down, and we acted like the rabbits lived there. I think it was our number one obsession for those few years.